Marvel Studios is expected to go into production on Captain Marvel, its first female-led superhero movie, this month, but it’s still filling out the cast list. Deadline reports that She’s Gotta Have It star DeWanda Wise will co-star alongside Brie Larson, Jude Law and Ben Mendelsohn and Samuel L. Jackson in an as-yet-unspecified role. 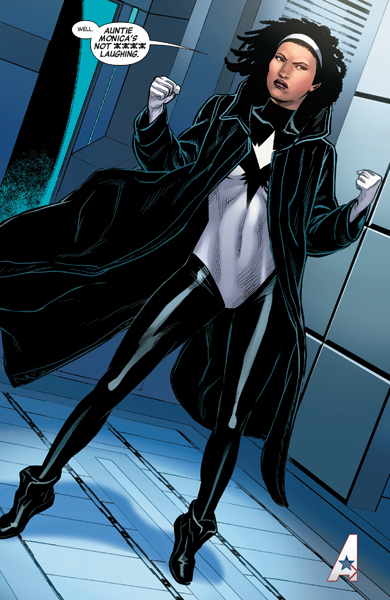 According to IMDb, Wise might be playing the first woman to take the name “Captain Marvel,” Monica Rambeau, a former lieutenant in the New Orleans Harbor Patrol who gained super powers after being exposed to extra-dimensional radiation. Rambeau was once a member of an all-black team of heroes that included Black Panther, Luke Cage, Blade and Brother Voodoo that fought off a vampire outbreak in New Orleans following Katrina. She was also a member of the Avengers. The script for Captain Marvel was written by Nicole Perlman and Meg LeFauve and will be directed by Anna Boden and Ryan Fleck (Mississippi Grind). That would be cool if she plays Rambeau. We could get two new female heores in one movie.